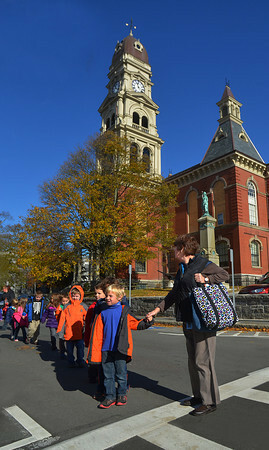 Kindergarten teacher Susan Destino of Plum Grove Elementary School guides hr students past City Hall on their way to the Sawyer Free Library during a special field trip Friday to visit several municipal centers. Destino's students, along with Tina Bowling's class, visited the library, post office and downtown fire station. The children are currently reading "Miss Bindergarten Takes a Field Trip with Kindergarten, by Joseph Slate and Ashley Wolff, and the trip was designed to complement their reading experience.